Housing is one of the most pressing problems for communities across the US. Too many low-income homeowners and renters are being forced from their homes by bank foreclosures, mainly in communities of color. Some of the forces to blame are predatory loans, mortgage payments that are still based on housing-bubble prices, bank greed and negligence, and the failure of toothless government programs. Many neighborhoods are suffering gentrification as real estate speculators take advantage of these profound structural problems in the capitalist system. And there is no end in sight. 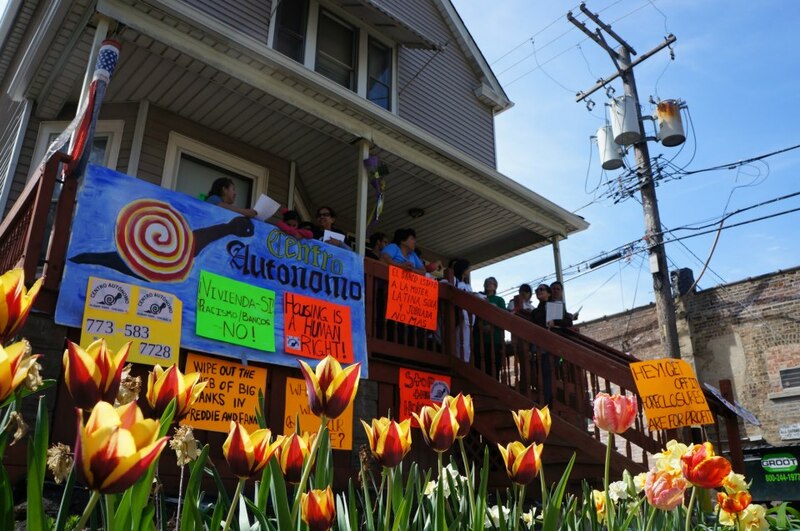 In Albany Park on the northwest side of Chicago, one of the most ethnically diverse neighborhoods in the US, more than a quarter of homes are underwater, and about a fifth are currently in foreclosure or pre-foreclosure. Four banks – Wells Fargo, Citi, Chase and Bank of America – along with two government controlled agencies – Fannie Mae and Freddie Mac – manage the vast majority of foreclosures. Housing work at the Centro Autónomo is based on a fundamental ethical principle that housing is a human right and a basic principle of organizing, that the people, united will never be defeated. Our dream is to establish community control over the land. We approach foreclosures and evictions collectively, with people who are directly affected developing strategies and tactics to defend our homes from predatory banks and speculators. Bilingual (English and Spanish) housing meetings at 6:30pm on the second and fourth Thursday of each month include national and local updates, education about the roots of the housing crisis, and strategy sessions so directly affected communities can take charge of their situations rather than waiting passively as complicated and unintelligible bank/government bureaucracies have their way. 1. Volunteer lawyers working with the Resistance Legal Clinic, founded with the assistance of Centro Autónomo, provide free legal advice. The point is to keep families in their homes as long as possible, allowing time for the political struggle and solidarity to grow. Freddie Mac and Fannie Mae to reduce principal, and on the sheriff’s office to delay or prevent evictions. 3. The struggle for long-term affordable housing includes pressure on banks to live up to their commitment to donate homes to community organizations and to establish alternative forms of home ownership/control that removes homes from capitalist market dynamics.